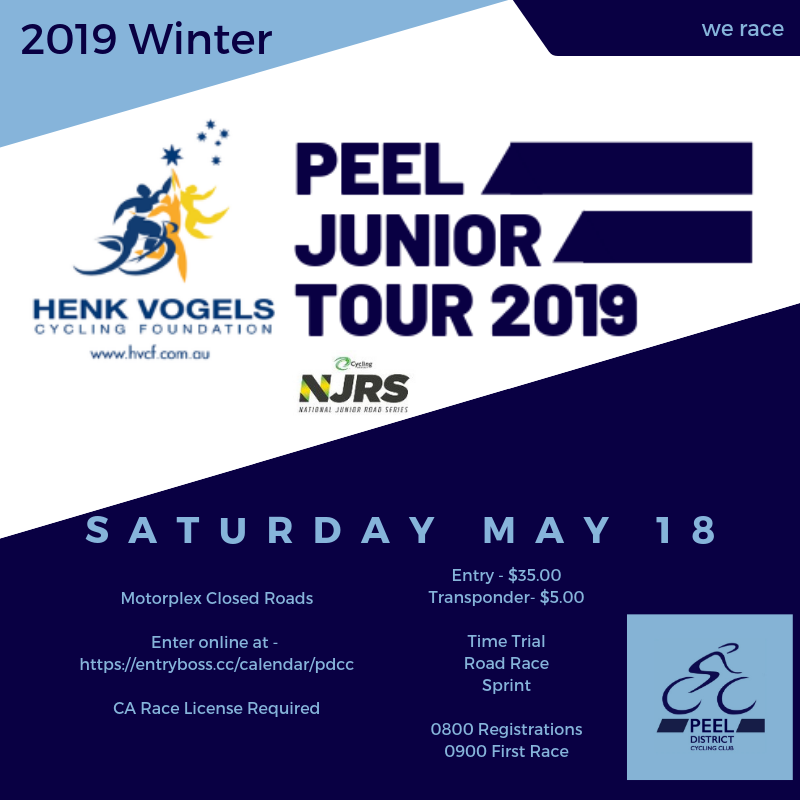 Peel District Cycling Club has a very strong history with Junior cycling development, that is why we are very proud of the partnership with the Henk Vogels Cycling Foundation to bring to you the 2019 Junior Tour. The Henk Vogels Cycling Foundation has a long history in supporting Junior competitors reach their goals through offering financial support to attend events and purchase equipment. The HVCF has a very long list of grant recipients which includes some very significant names in Western Australian cycling. This list can be found on their website. The tour will again be held at the Kwinana Motorplex facility which allows for a car free safe environment for all competitors. Racing will consist of a Time Trial, Road Race and a Sprint event which will be conducted over the day. This year, due to the new partnership with the HVCF, the club is offering training sessions prior to the tour. These sessions are designed to build the skills of existing competitors, and to allow for new people interested in cycle racing to find out what it is all about without the pressure of just turning up to a race. The sessions will be run at the Motorplex on April 14 and May 4 prior to the main event on May 18. The training before the event, and racing in the tour are designed to allow a pathway for Junior competitors to rise through the cycling ranks by offering a supportive environment for all abilities. The club is very proud of the results of all of our Juniors as they progress, and are looking to develop the next wave of stars. The club is looking forward to the Henk Vogels Cycling Foundation Peel Junior Tour 2019, and hope to see new and old competitors alike at the training sessions and tour in May.